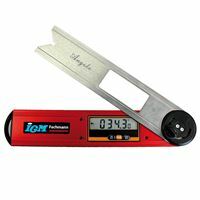 The IGM FDU-002 Digital Angle Finder is an instrument with various properties. It features a large LCD display with a readout of measured values. Solid but light build guarantees sturdiness and long life. The display also shows the position of the arm against the body. The range of measured angles is 225°. Repositioning the locking pin allows you to change the angle range. You can rotate the arm by 360° after completely removing the pin. Measures internal and external angles. Easy to operate with just three buttons: on/off, HOLD and a button for absolute value (ABS) and reset. The real angle function is on when ABS is on. Another function is the so-called disruption of measuring which allows you to display the latest measured value by pressing HOLD. The Angle finder can also serve as a level because of the bubble fitted on the top side. It is also equipped with a cut-out corner that allows you to check for right angles. You can use this feature when setting frames or checking your work after planing. Other handy features are the battery power indicator and automatic shutdown. Replacement of batteries is quick and easy.